I recently learned about a new program that merges three areas I am passionate about --Jewish camping, Israel, and technology. Israel has always embraced high technology and modern communication. Part of what has made the almost sixty-year-old nation's economy flourish in the past two decades has been the success of its hi-tech sector. Now a new summer camping initiative is making the hi-tech experience available to Jewish youth who are interested in spending a summer in Israel and also interested in technology. 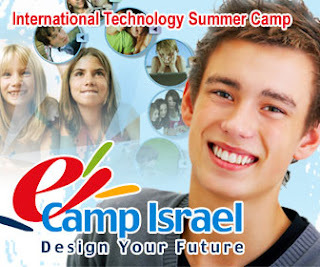 eCamp Israel is a technology summer camp based in Israel and open to American Jewish youth. As a member of the rabbinic cabinet of United Synagogue of Conservative Judaism's Project Reconnect, I was asked to look into the feasibility of including eCamp Israel as one of United Synagogue Youth's summer options in Israel. USY sends hundreds of teens to Israel each summer, and this program would allow some of those teens to specialize in a hi-tech track while in Israel. I am very impressed with this new program. eCamp's mission is to "help young people realize their highest potential, discover their talents, and reach for their dreams". Their cutting-edge e-workshops will allow each individual camper to express their creativity, and the youth participants will work on their own projects in a collaborative environment (open-space computer lab). eCamp, located in a residential educational institution near Caesarea, will not be a "computer camp" where kids sit in front of a computer all day. Rather, the camp will encourage the campers to go outdoors to do the normal summer camp activities like sports, swimming, and nature exploration. The camp will motivate campers to create a better world through the Jewish value of Tikkun Olam (repairing the world) with each camper receiving a certificate for 5 hours of community service per session. eCampers will meet with entrepreneurs including the founder of ICQ, now the originator behind the AOL Instant Messenger, visit leading Israeli research centers such as Intel, Microsoft, Google, Motorola, and train in the Israeli Air Force’s flight simulator. Participants will have experience theoretical developments by visiting leading academic centers such as the Technion and Weizmann Institute. Shai Agassi, a hero in Israel’s technology world and the founder of Project Better Place, will be eCamp’s Chief Scientist. When I spoke with Nir Kouris, co-CEO of ecamp and an Israeli entrepreneur, he explained that "As one of the global centers of technological innovation, it is time Israel gives back some of our know-how and share it with children from around the world." The idea of an International Technology Summer Camp in Israel is brilliant. Jewish youth already flock to Israel in droves each summer and many of them have to put their technology interests on hold during that time. So, while most Jewish youth won't be able to use Instant Messenger while they travel in Israel this summer, the campers at eCamp Israel will be introduced to the hi-tech gurus who developed the infrastructure to run Instant Messenger. This program will open the gates for Jewish youth to the #1 success story of Israel – Technology Innovation. eCamp is just one more piece of great news in the world of Jewish camping. Recently, the Jim Joseph Foundation and Foundation for Jewish Camping announced a $8.4 million partnership grant to create a Specialty Camping Incubator. The Incubator will create four Jewish specialty camps based on skills such as athletics, computers, and arts according to the successful model already established for Jewish camping. It is truly remarkable to see the innovations taking place in the field of Jewish camping. It makes me want to be a kid again!